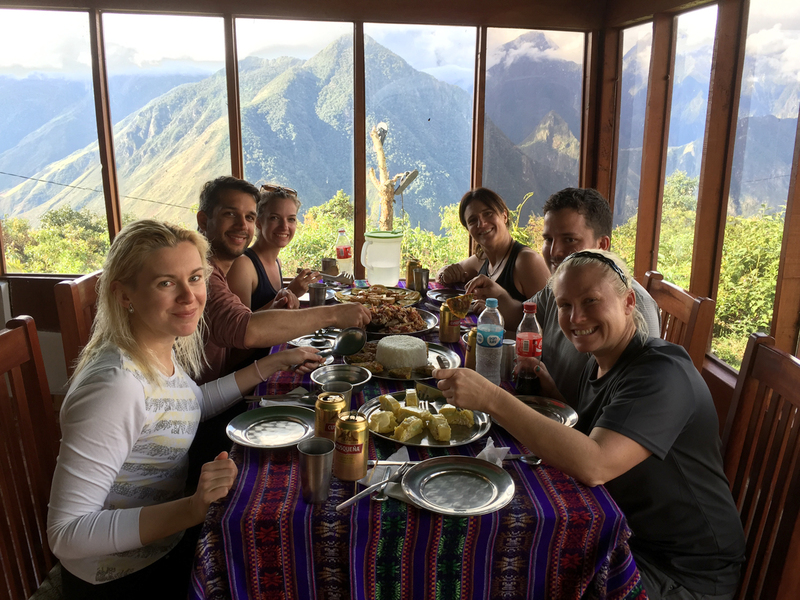 When we began planning our trip to Machu Picchu, we were overwhelmed at the choices of treks and trekking companies to choose from. Like anyone would, we began with a lot of general Google research, then checked TripAdvisor to see which companies had the highest ratings. 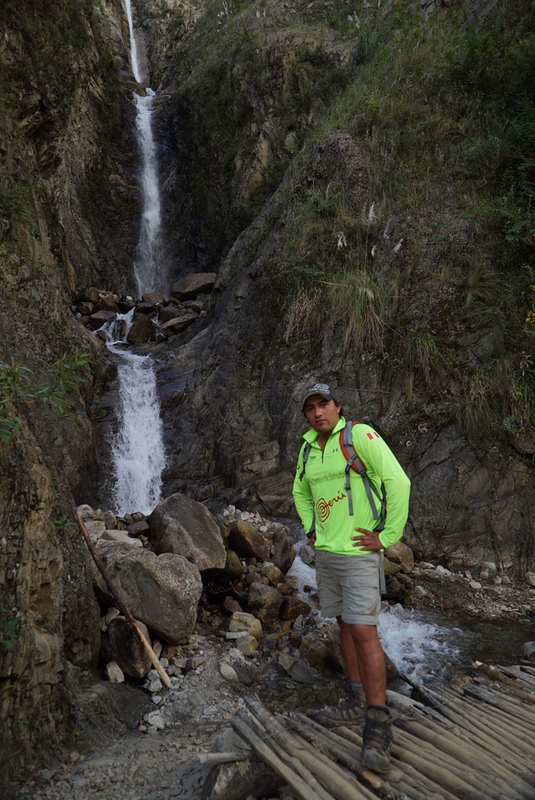 Deciding on the Salkantay trek instead of the classic Inca Trail helped narrow our options. 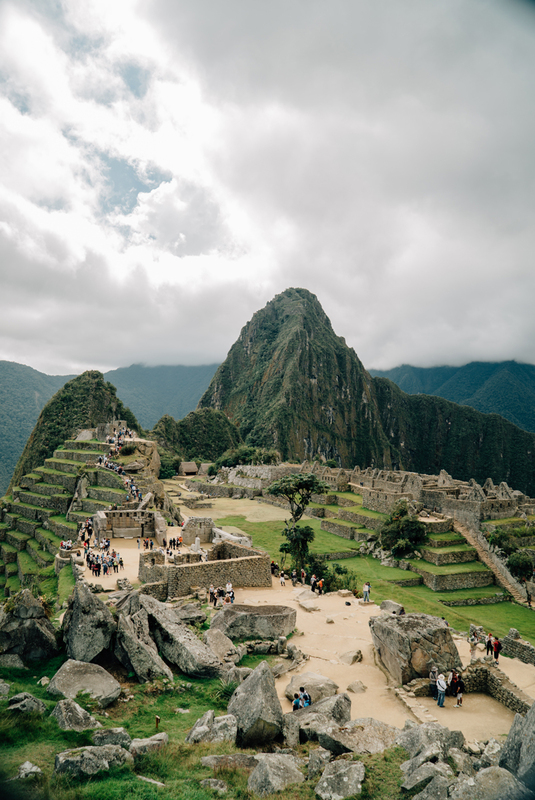 The classic Inca Trail is limited to 500 people per day, meaning you need to plan months in advance to secure your ticket. We had plenty of time, but kept reading about the incredible scenery of the alternate Salkantay trek, from snowy peaks to cloud forest to jungle, and decided it was right for us when we were reminded there would be almost no one else on this trek, while the Inca Trail could feel quite crowded. They weren’t kidding about the views of Salkantay! 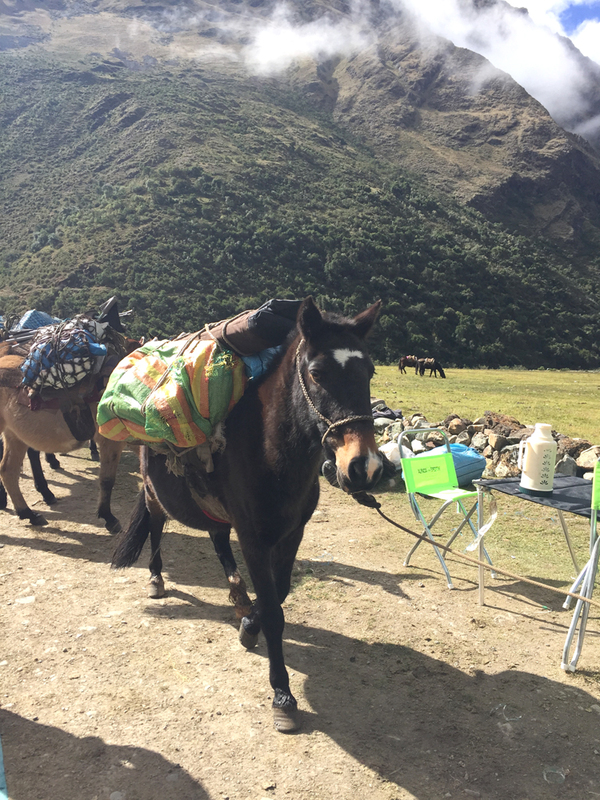 Alpaca Expeditions stood out to us, because in addition having great ratings on TripAdvisor, their trekking route had us crossing the Salkantay Pass on the first day. We felt like this was an advantage because we knew the adrenaline of the first day would help us blaze through the highest altitude portion of the trek. 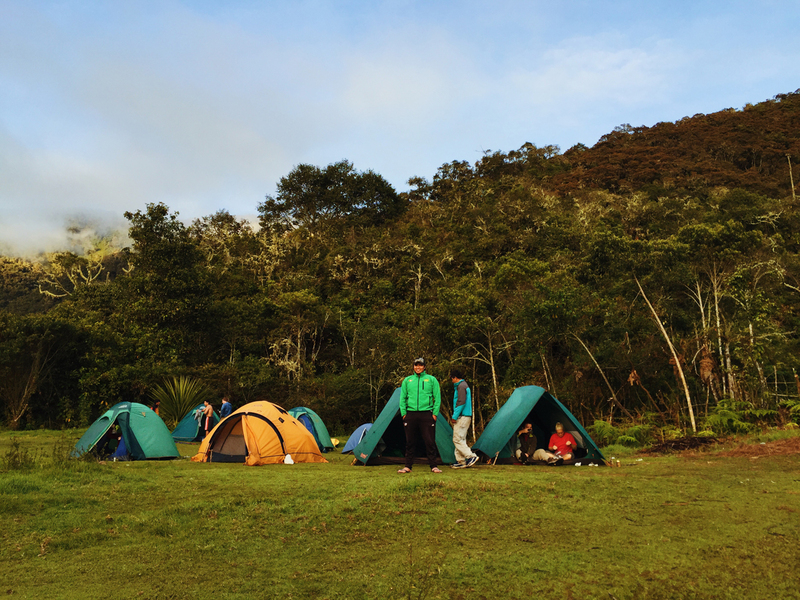 They are also one of the only companies to camp at Llactapata, an important Inca site with Machu Picchu views. Once we checked out their Facebook page, we found out they participate in education initiatives for local villages, make serious recycling efforts to keep the trails clean, and they take good care of their porters and their families. Many porters have made the treks their whole lives without ever seeing Machu Picchu, so when Alpaca posted this on facebook, we knew we had made a good choice. 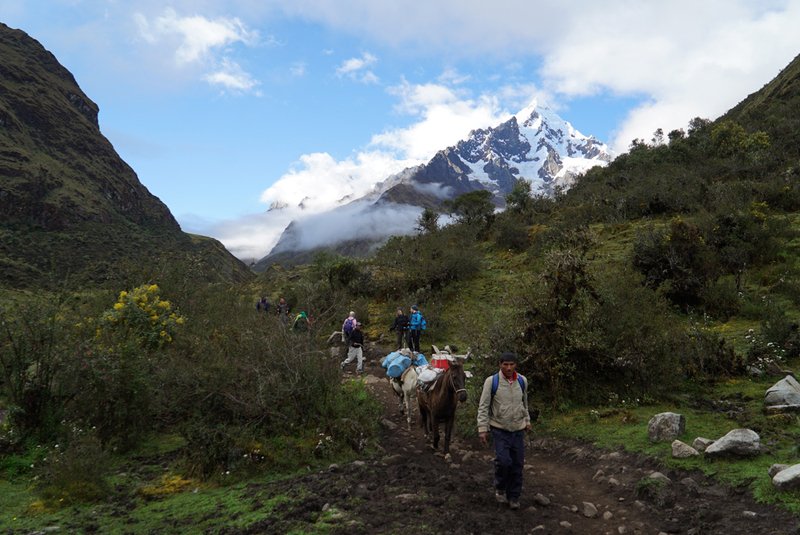 Our amazing porters passing us on the trail. 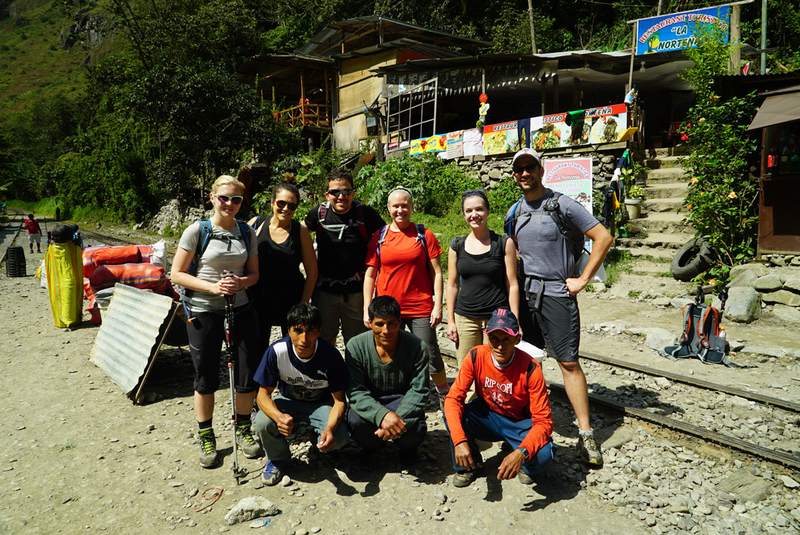 Our group with our porters. Alpaca kept in good touch with us and was very informative about what we needed to bring (see our packing list here). They provided rain ponchos, tents, sleeping mats, pillows, and a heavy wool blanket for the first night which was quite cold. 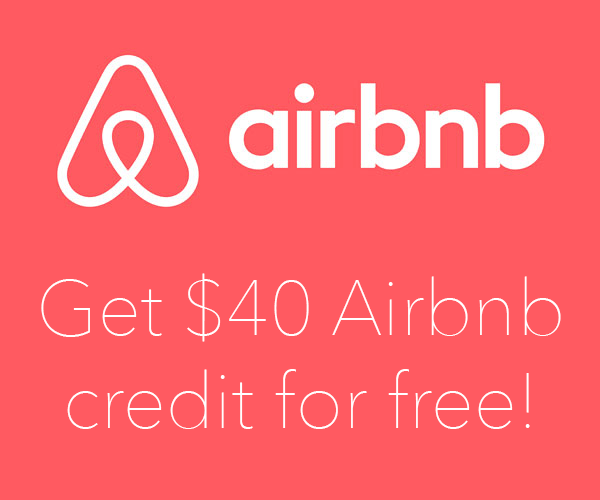 They offer for renting: sleeping bags, additional thicker sleeping mats, and trekking poles, should you need any of that. Our campsite on the first night. They have photos on their website of portable toilet tents they bring to each campsite, but every lunch stop and every campsite we stayed at had actual toilet facilities, and some even had a shower. 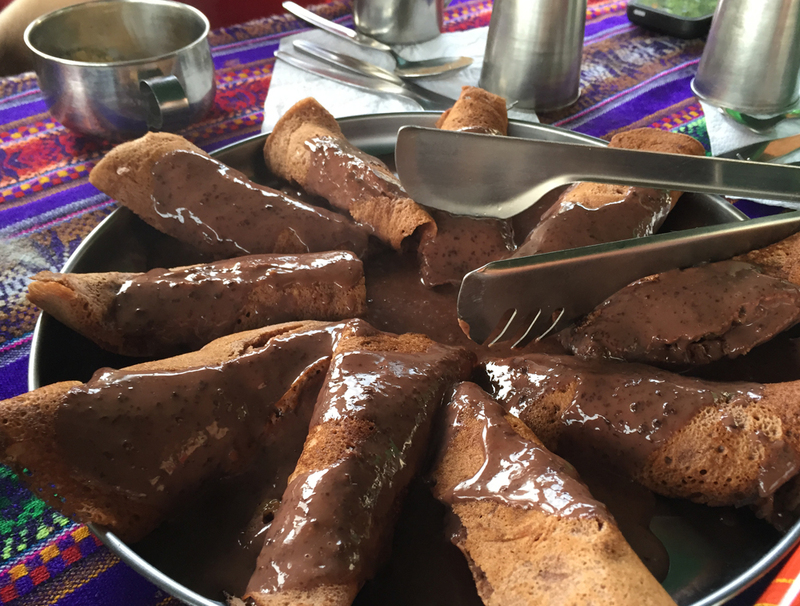 The food on the trail was incredible—some of the best meals we had in Peru—and there was always plenty to eat. 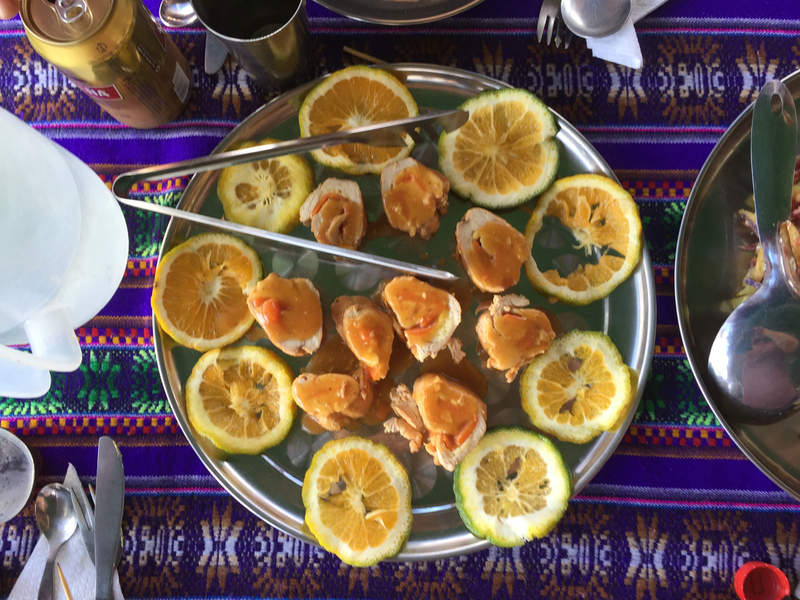 They woke us up with coca tea every morning, and had hot water and soap to wash our hands before every meal. They boiled water for us at breakfast and lunch to refill our water pouches for the day, and they gave us snacks every morning to take with us for the trek, which usually included a piece of fruit and a package of chocolate crackers. 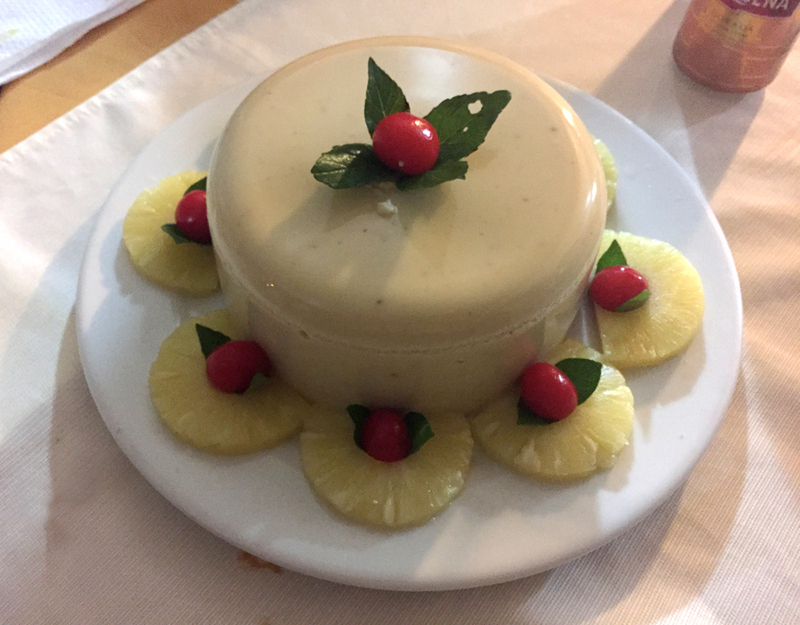 Enough about it—here’s the pics! Some of the mules carrying our luggage. 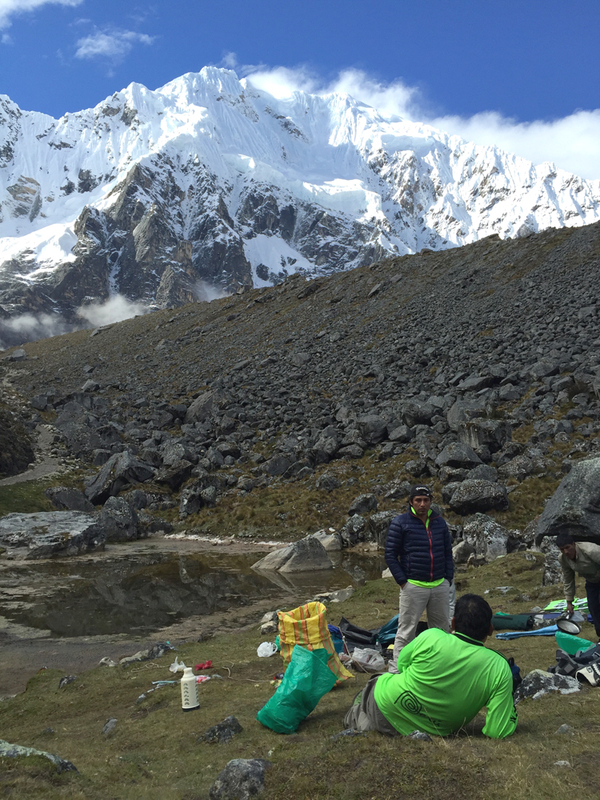 “Green Machine” staff relaxing after lunch at the base of Salkantay Peak. 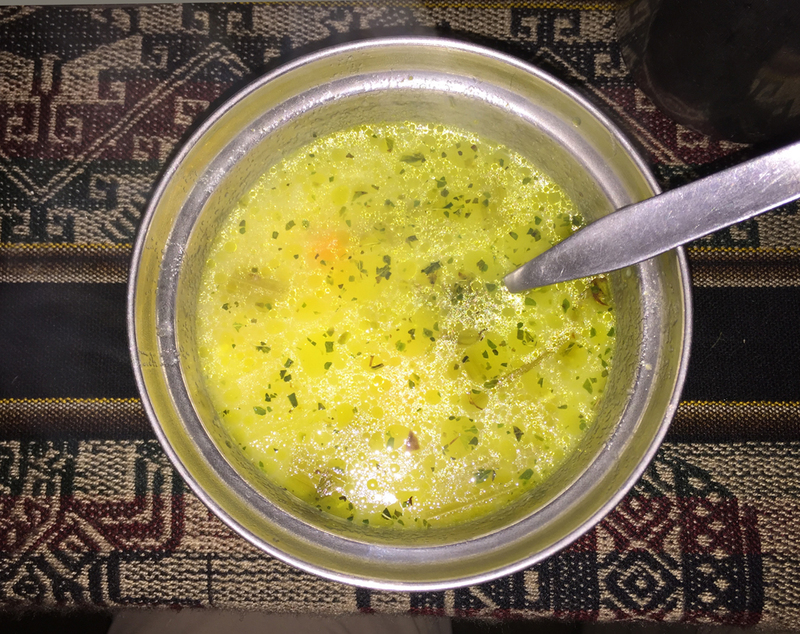 Lunch always began with soup. Our group at the first campsite. 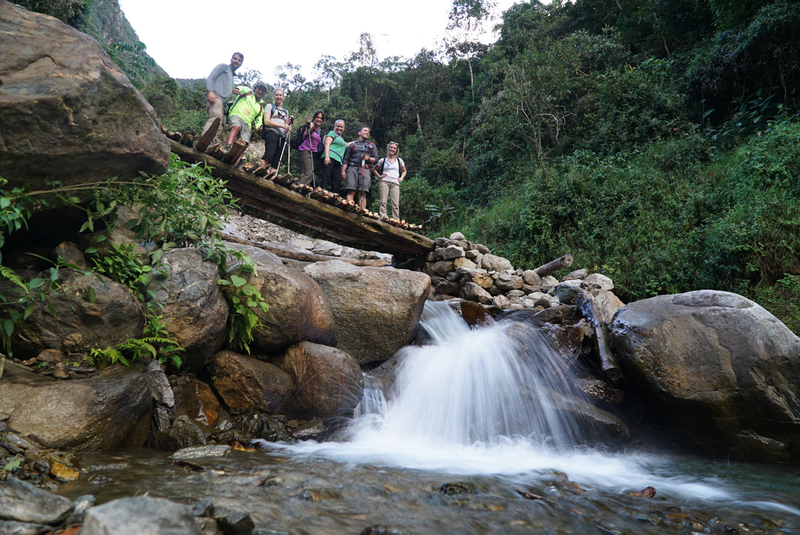 Our group on one of the many waterfall crossings. Indoor eating area at Llactapata. 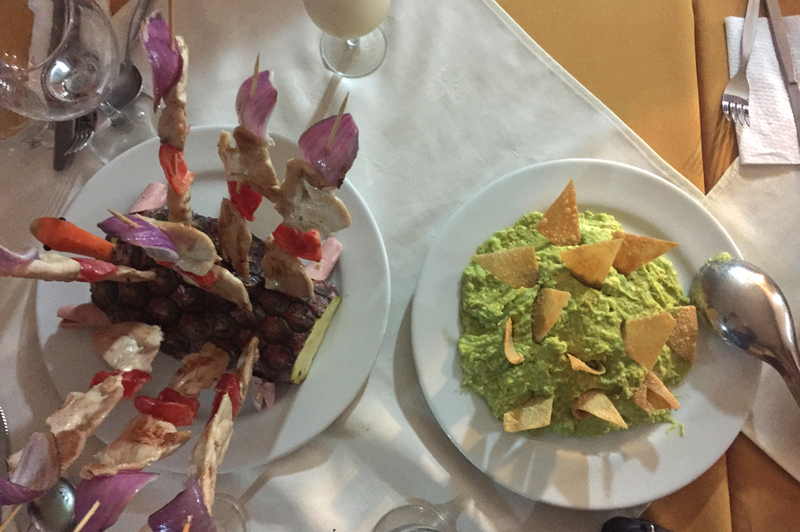 Our cook prepared dinner for us inside a restaurant when we got to Aguascalientes. Incredible Machu Picchu—the end of our journey. A note about tipping: You need to bring extra cash with you for your horsemen, porters, cook, and guide. Your trekking company should give you more details on what’s a recommended amount. 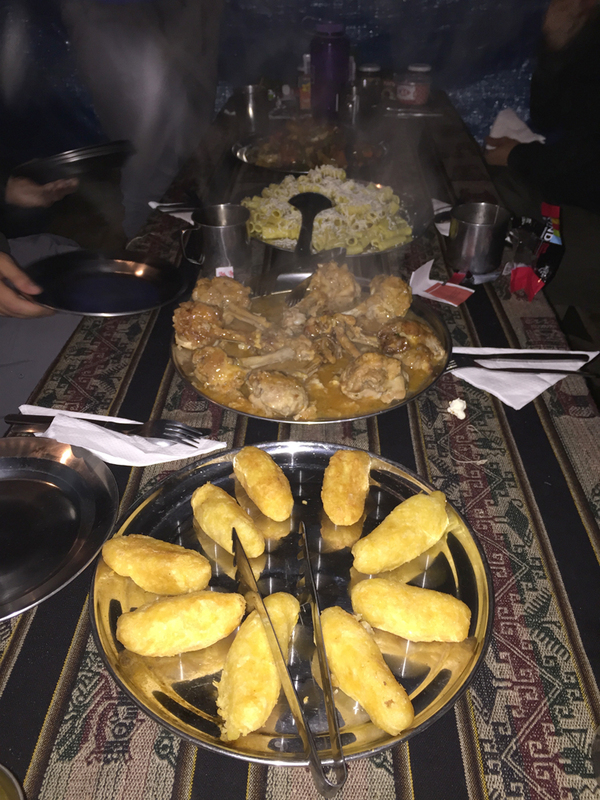 The whole team at Alpaca Expeditions took great care of us! 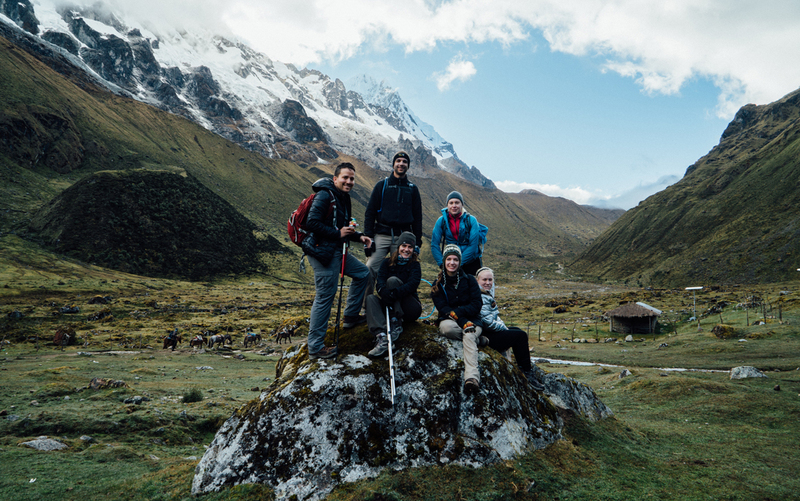 We feel so fortunate to have had such an incredible trip thanks to these guys who work day and night to help us experience the beauty of the Sacred Valley. 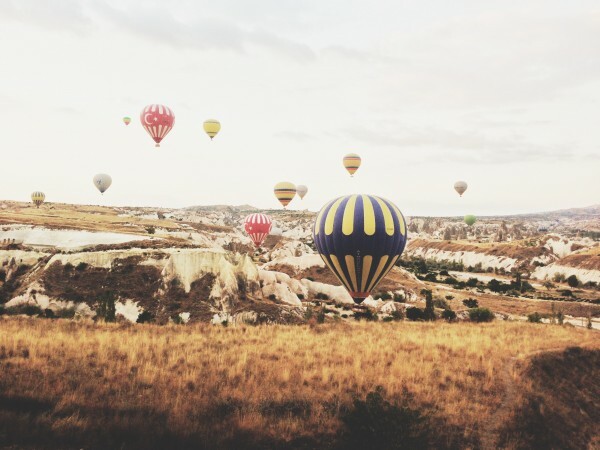 The journey is the destination! Wow, great looking website! 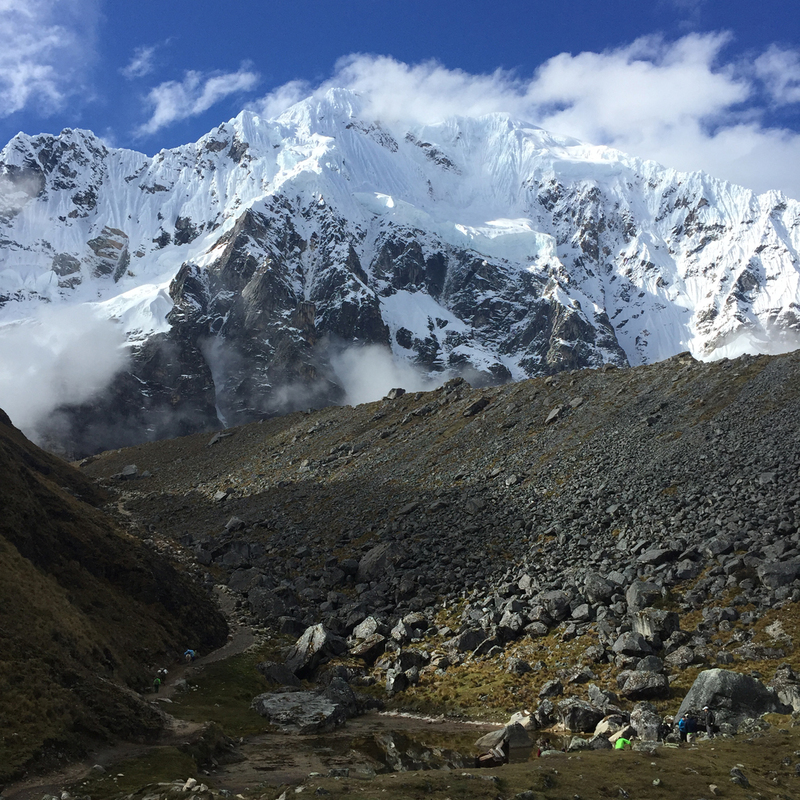 I have booked the exact same Salkantay Trek, can you tell me exactly how much you tipped? Also at what date/time was your trip? We followed the tipping guidelines given to us by Alpaca. 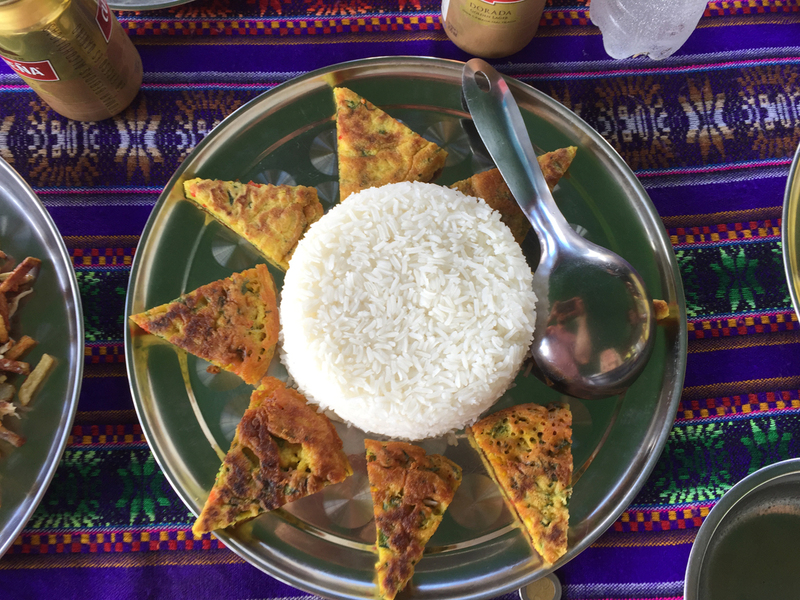 Your guide will let you know how much to tip the porters and cooks. 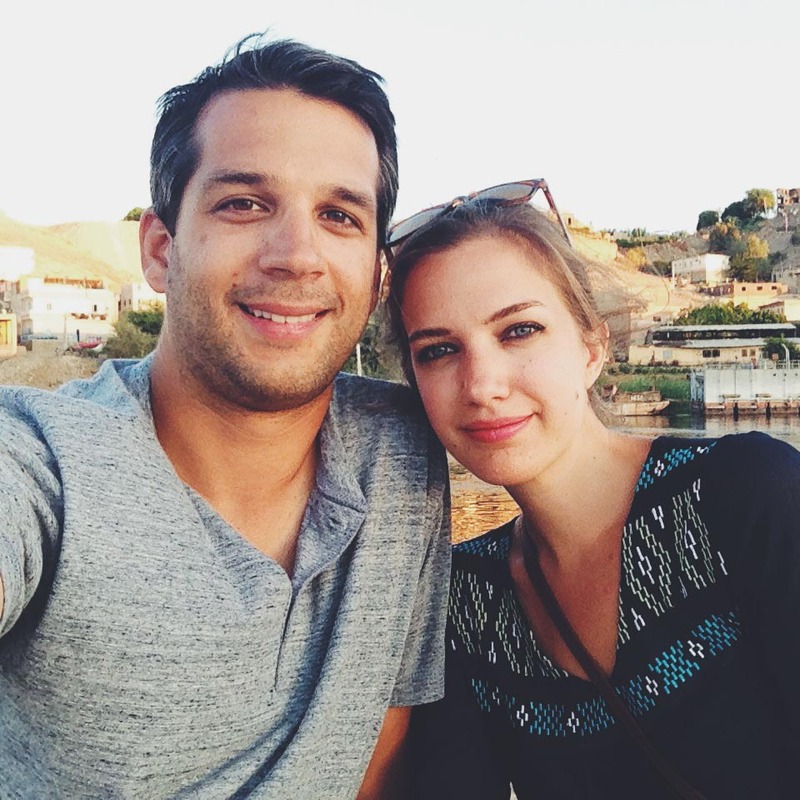 For our guide, it was up to us, so as a group we decided to tip about $50USD per person.